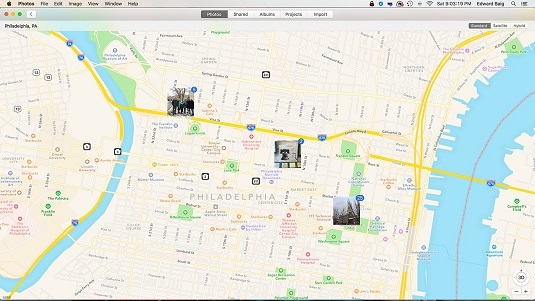 Your Mac has a handy Maps Feature that can give your more information about your photos. Many of today’s cameras (and virtually every state-of-the-art camera phone) are so clever that they can detect where they are — and, by proxy, where the shooter is — when a picture is snapped. So it stands to reason that if your camera knows where a picture was taken, Photos can exploit location information for your benefit. Photos that have been geotagged partly rely on the Global Positioning System (GPS) coordinates that your camera captures along with the image. Remember that the headings in the Years, Collections and Moments views include location information, if known. Clicking the header inside Photos effectively morphs it into the Maps app. Overlaid on top of the maps are thumbnails that represent the photos taken in the areas shown on the map. The number on the corner of the thumbnail tells you how many pictures were taken in the area. If you click the thumbnail, you can view those very pictures. The Places feature maps your Photos library. You can reveal more of a map by dragging. Double-click or (via trackpad) pinch to zoom in on an area. Or click + or – to zoom in or out, respectively. You can even switch the look of the map to a satellite view, a standard map view, or a hybrid of the two. Just click the corresponding button in the upper right. Even if you hadn’t clicked a place, you can check out a photo’s location on a map. Click the Info (i) button to open the Information pane, and you can see where the picture was taken on a small map adjacent to the actual photograph, with a red pushpin pointing to the right spot. Don’t fret if your camera can’t capture location data. You can type your own location information and be as general (such as Chicago) or as specific (Grandma’s house) as you like. Just type the more specific location name in the Assign a Location section of the Information pane. You can also add animated maps to slideshows and maps to photo books. If Photos doesn’t seem to be capturing location data, open System Preferences, make sure the Enable Location Services setting (found on the Privacy tab in Security & Privacy) is selected for Photos. Meantime, in Photos Preferences, if you select the Metadata: Include Location Information for Published Items option, any location information captured with your pictures is included if you share those images via email or on an online photo site such as Flickr. Deselect this item if you don’t want to include such information when you share your pictures in cyberspace.